For all those times when she had your back and saved you from your parent's wrath, she deserves to be loved. On the occasion of Raksha Bandhan, thank her for always supporting you and loving you endlessly in a special way. 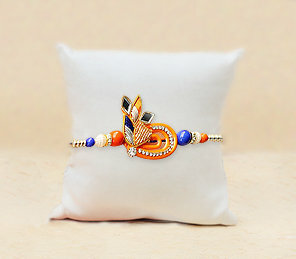 So, order the best Rakhi gifts for sister from FlowerAura and make her feel pampered. Raksha Bandhan is an auspicious Hindu festival that celebrated the bond of love between a brother and a sister. It is one of the important festivals in India that people across the country celebrate with utmost fervor. The festival of Raksha Bandhan illustrates the eternal bond of love, care, and affection between a brother and a sister in the most beautiful way. They may squabble all year through, hiding the love for each other. But, on Raksha Bandhan a brother and a sister express their sentiments of love, warmth, care and support for each other. In fact, it is on this day when the sisters make efforts in picking the most beautiful rakhi for their brothers and the brothers look for the best rakhi gifts for sister. So, if you are also blessed with lovely sisters and are seeking for the best rakhi gift ideas for sister then, you are at the right place. We, at FlowerAura, have come up with a wide variety of thoughtful and trendy online rakhi gifts for sister that will not just make your rakhi celebration brighter but also put a beaming smile on your sister's face. Raksha Bandhan or Rakhi is the best occasion to express your love-filled emotions for your dear brother or sister. To help you express your love and care for your dearest sister, we provide a wide range of Rakhi return gifts for sister that are sure to be loved by her. Take a look. Coffee Mugs: Our range of customized mugs make the best gift for sister on Rakhi as they have a personal touch of love and warmth. Our customized mugs make the perfect Raksha Bandhan gifts for sister as they are creatively designed with sisters quotes printed on it. Accessories: If you are looking for rakhi gifts for married sisters, then you can check out our range of women accessories that include wallets, statement necklaces, grooming kits, branded nail paints, and lipsticks etc. Chocolates: Needless to say that chocolates make the best return gifts for sister on Rakhi. Our wide assortment of chocolates includes the best quality chocolates like the Toblerone, Ferrero Rocher, Cadbury Dairy milk, handmade chocolates, etc. Houseplants: If you are looking for a thoughtful rakhi gift for your sister who is married then, you cannot give any better gift other than a houseplant. Order a houseplant from us and gift your sister on Rakhi to ensure her a house full of fresh and clean air to breathe. Cushions: Our range of Rakhi special gifts for sister also include a wide variety of customized cushions that are designed with beautiful sister quotes digitally printed on both sides of the pillows. Personalized Gifts: FlowerAura offers you a wide variety of personalized Rakhi gifts for sister that include personalized bottle lamps, photo frames, key chains etc. Raksha Bandhan Gifts for Sister Online Delivered Across India. For brothers, it might seem a little time taking to look for perfect Rakhi gift hampers for sisters from large collection of latest gifts like printed mugs online, chocolates etc. that convey their emotions best. And when you are sharing a long distance relationship, the lack of communication tends to create a gap, unknowingly. Do not feel gloomy for being away from your sister on Rakshabandhan. Because this is the reason why FlowerAura decided to step in and bridge the gap and strengthen the bond between in brother and a sister. So, when there is an option of making your favourite pick just with the Rakhi special return gift ideas for sister online and that too with free shipping from FlowerAura, you can sit at the ease of your home and send your tokens of love to redefine your bond of love and protection. Now, send the best rakhi gift to sister on Raksha Bandhan without worrying about the delivery time because FlowerAura ensures same day rakhi gifts delivery in India. That moment when Rakhi from your kid sister reaches you on the day of Rakshabandhan, you undoubtedly, feel overwhelmed and wish to reciprocate similar emotions. This is when FlowerAura steps in with the same day delivery of gifts and hampers to strengthen your relationship with your sister. This is the only day when you keep all the squabbles aside and actually confess the years of love and care that you both have in the deep corner of your hearts. FlowerAura has an extensive assortment of gifts, hampers, cakes and flowers ranging from personalised mugs to chocolate bouquet online. So, if you are planning to wish your sister a Happy Rakshabandhan too, count on FlowerAura for all your needs. Why? Well, FlowerAura is your messenger of emotions and makes sure to deliver your sentiments along with love filled hampers related to relationship of brother and sister. With a wide variety of Rakhi return gifts like Life Size Love, Chocolate Treasure Chest, Chocolate Wheel, Smiley Cuddly Combo, Blue Passion and so forth, spell out your deepest emotions for your younger sister in the most love-filled manner. Each gift is thoughtfully chosen, each bouquet is lovingly wrapped to make your rakhi gift for married sister a lot meaningful. Besides, the hassle free delivery services from FlowerAura is sure to add charm to the occasion in a lot of ways. Not just this, keep all your worries aside when it comes to the price of products. FlowerAura makes sure to make each hamper of love pocket friendly so that you don't have to think twice before gifting your dear small sister. That too, with an option of free shipping, we are all set to deliver smiles across 170+ cities. So, why wait! Rakhi gifts for sister give the widest smile and celebrate the bond of a lifetime.